MINNEAPOLIS – Cross-country skiing, skijoring and tubing are just a few of the activities that visitors can witness when the American Birkebeiner International Bridge comes to Super Bowl LIVE presented by Verizon. Spanning almost 200 feet, the American Birkebeiner International Bridge will be constructed on Nicollet Mall over 9th Street for the 10-day free and open to the public Super Bowl festival, providing 1 million Super Bowl visitors with a flare of the Bold North. The American Birkebeiner International Bridge is an iconic centerpiece of the American Birkebeiner, North America’s largest cross-country ski race held each February in Hayward, WI. The American Birkebeiner (Birkie) is a nearly 35-mile cross-country ski marathon that traverses its way through the north woods of Wisconsin on the legendary Birkie Trail. This is the first and only time the American Birkebeiner International Bridge has been outside of Hayward, WI, where it is normally assembled once per year for the American Birkebeiner “Birkie” week of festivities. The 44th Annual American Birkebeiner week of events will commence on February 22-25, 2018, only weeks after Super Bowl LIVE presented by Verizon. Through a partnership between the Loppet Foundation and the American Birkebeiner Ski Foundation, the bridge will travel to Minneapolis where it will be used as part of the City of Lakes Loppet Festival. 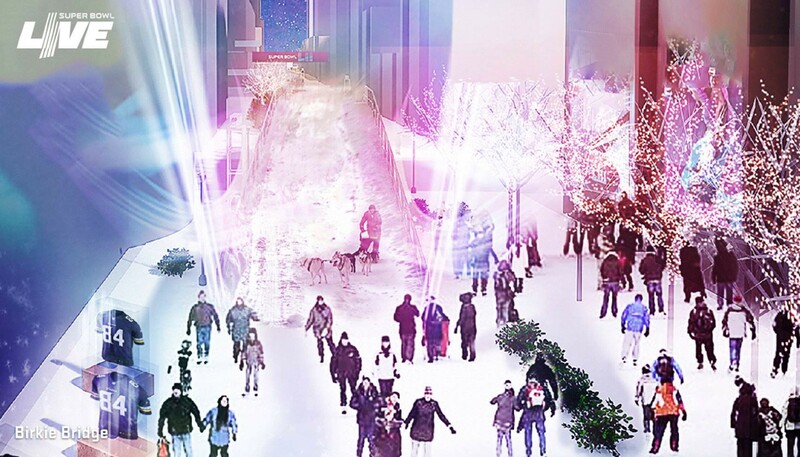 The Loppet Foundation, Minneapolis’ champions for winter sports, will bring snowmaking capabilities into downtown — transforming two blocks of Nicollet Mall into a winter playground. The spectacle is part of the City of Lakes Loppet Festival, a multi-day celebration of winter sports in Minnesota which includes races in cross-country, fat biking, skijoring, speed-skating, and more. The American Birkebeiner International Bridge spans 198’ from end to end (entrance ramp to exit ramp), with a two-lane traffic tunnel measuring 14’ 6” high that will allow traffic to cross the Nicollet Mall at 9th Street. The elevation of the top, or floor of the bridge, is 16’ high and measures an impressive 24’ wide. Delivering and constructing the American Birkebeiner International Bridge at Super Bowl LIVE presented by Verizon will be no small task. The bridge will be transported from Hayward, Wisconsin in sections via an estimated twelve, well-orchestrated semi-trucks that will depart for Minnesota in early January. In addition to building the bridge, approximately twelve dump truck loads of snow are required to cover the American Birkebeiner International Bridge alone for the winter festivities that will take place during the festival. NBC will set-up its national broadcast from alongside the American Birkebeiner International Bridge, giving a national spotlight to the Bold North and winter fun throughout the 10-day Super Bowl festival. The American Birkebeiner International Bridge is just one of the many attractions at Super Bowl LIVE presented by Verizon, the free, 10-day festival that will include music, food, fun, and much more. Earlier this month, Jimmy Jam and Terry Lewis and the Minnesota Super Bowl Host Committee announced the first 19 of many performers and musical acts who will play free concerts at the Verizon Upstage by Ice Mountain on Nicollet Mall. In addition to Super Bowl LIVE presented by Verizon, the NFL is bringing many exciting events to Minnesota. At the beginning of the month, the NFL began selling tickets to Super Bowl Experience Driven by Genesis – pro football’s interactive theme park, an event that offers fans a unique chance to get involved in the festivities surrounding Super Bowl LII. Tickets can be purchased on nfl.com/SuperBowlExperienceOnSale. Fans may visit SuperBowl.com for more details. With Super Bowl LII just 46 days away, fans can stay tuned to our Super Bowl LIVE presented by Verizon website for more exciting announcements and updates.